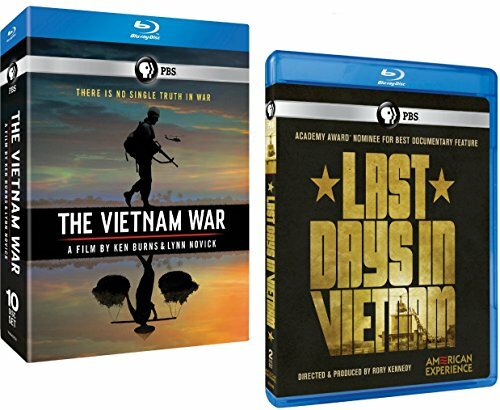 Get the whole story: Ken Burns and Lynn Novick's 10-part series, THE VIETNAM WAR, plus both the Academy Award®-nominated theatrical release LAST DAYS IN VIETNAM and the extended AMERICAN EXPERIENCE broadcast version! The comprehensive documentary, THE VIETNAM WAR, tells the epic story of one of the most consequential, divisive, and controversial events in American history as it has never before been told on film. Visceral and immersive, the series explores the human dimensions of the war through revelatory testimony of nearly 80 witnesses from all sides: Americans who fought in the war and others who opposed it, as well as combatants and civilians from North and South Vietnam. Ten years in the making, this series includes rarely seen, digitally re-mastered archival footage from sources around the globe, photographs taken by some of the most celebrated photojournalists of the 20th Century, historic television broadcasts, evocative home movies, and secret audio recordings from inside the Kennedy, Johnson and Nixon administrations. Then watch LAST DAYS IN VIETNAM (both the original theatrical and the extended TV versions are included) as it chronicles the chaotic final days of the Vietnam War. In April 1975, the North Vietnamese Army closed in on Saigon and the South Vietnamese resistance crumbled. With the lives of thousands of South Vietnamese hanging in the balance, and at the risk of their careers and possible courts-martial, a handful of U.S. diplomats and military operatives still in the country took matters into their own hands as they waged a desperate effort to evacuate as many as possible. In total, this complete collection presents well over 20 hours of programming on 12 discs. Subtitles in English (SDH). As seen on public television.